Beacon Press: Shout, Sister, Shout! Long before “women in rock” became a media catchphrase, African American guitar virtuoso Rosetta Tharpe proved in spectacular fashion that women could rock. Born in Cotton Plant, Arkansas, in 1915, Tharpe was gospel’s first superstar and the preeminent crossover figure of its golden age (1945 1965). Shout, Sister, Shout! 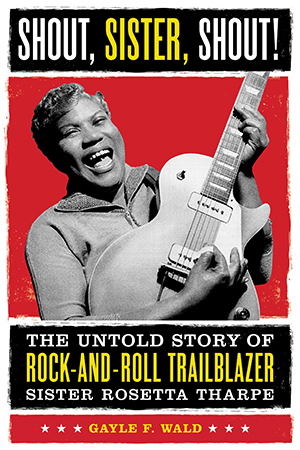 is the first biography of this trailblazing performer who influenced scores of popular musicians, from Elvis Presley and Little Richard to Eric Clapton and Etta James. Tharpe was raised in the Pentecostal Church, steeped in the gospel tradition, but she produced music that crossed boundaries, defied classification, and disregarded the social and cultural norms of the age; incorporating elements of gospel, blues, jazz, popular ballads, folk, country, rhythm and blues, and rock and roll. Tharpe went electric early on, captivating both white and black audiences in the North and South, in the U.S. and internationally, with her charisma and skill. People who saw her perform claimed she made that guitar talk. Ambitious, flamboyant, and relentlessly public, Tharpe even staged her own wedding as a gospel concert-in a stadium holding 20,000 people! Wald’s eye-opening biography, which draws on the memories of more than a hundred people who knew or worked with Tharpe, introduces us to this vibrant, essential, yet nearly forgotten musical heavyweight whose long career helped define gospel, r&b, and rock music. A performer who resisted categorization at many levels-as a gospel musician, a woman, and an African American-Tharpe demands that we rethink our most basic notions of music history and American culture. Her story forever alters our understanding of both women in rock and U.S. popular music.